Redacted Amazon incentive info from Frisco. A manila envelope provides false hope. Sitting on my desk this morning was a weighty manila envelope with a return address belonging to a law office. If you’re not a journalist, this could be a bad thing. If you are, and you recently filed a records request, this gives you a nice Monday adrenaline boost. I’ve been trying to eke out the details of the region’s last few offers to lure Amazon’s HQ2. Frisco, Plano, and Irving have spurned my advances, contesting the requests to the Attorney General’s office. The AG has 45 days to get back to them; these things can get dragged out so long that nobody ends up caring about the information in question. But I’m stubborn, and the AG finally ruled a couple weeks ago. The envelope was about an inch thick, which is typically a good sign. But alas, when it comes to the money Frisco offered, we’re left to wonder. Everything is shrouded behind blocks of ink from a black felt pen. Nowhere are tax breaks discussed. Instead, we have some pages of heavily redacted materials, as you see in the photo above this post. One of those is labeled, “Amazon Benefits.” The others appear to correlate with where the table of contents indicates there would be talk of incentives. You can make out a few words where the redact-er got sloppy: “incentives” and “dollars.” I think this is plenty of proof. By now some people are rolling their eyes at every headline about HQ2, and it’s hard to blame them. But cities were putting up massive subsidies to lure the retail behemoth. It feels fair that we’d get to see how much our city officials were willing to give up. In ruling that Frisco could partially redact its pitch, the AG apparently decided otherwise. When I talked to someone at the office’s Open Government line a few months back, the general thinking was that these cities were just delaying the inevitable, that the AG would rule for transparency and they’d have to publicize their offers. In fact, in the case of a previous AG ruling on a records request from our own Peter Simek in early 2018, the AG ruled with us—and then the city of Plano sued the state to keep the records secret. I’m not sure what changed. Around the same time I got back the AG’s ruling on Frisco a couple weeks ago, the same came in for Plano and Irving. The letters say those cities can withhold parts of their pitches to Amazon. 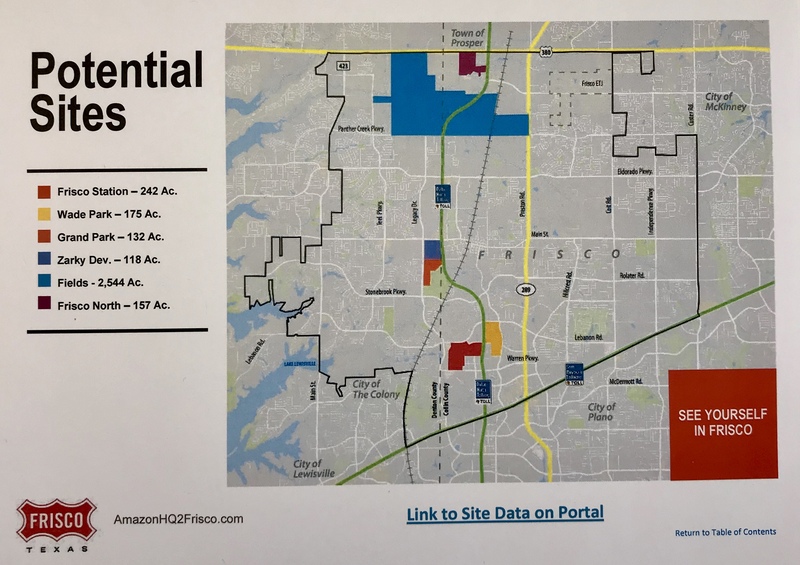 I’ve also been in talks with the city of Dallas to try and get a more full picture of its offer (you’ll remember the city released a summary of details shortly after Amazon chose their destinations). After pushing it down the line for months, the city now says it will publish a big data dump in early March, but they’re also working off an AG ruling that allows partial redaction. • Frisco doesn’t have to tell us how much money they offered Amazon. • Irving and Plano probably don’t either. • My faith in thick manila envelopes has taken a hit.